There’s some noted animosity between the President and the liberal news network as of late. Just a few weeks ago at the White House Correspondent’s dinner, Obama took a few jabs at CNN. Well, now CNN is firing back, going so far as to publish a report on a story in which Obama is being indicted in a massive cover-up over the death of Bin-Laden. You’ll no doubt remember the President conveniently showed the world he had orchestrated the killing of the world’s most wanted terrorist only days after publishing his birth certificate. So far it’s been one of his biggest claims to fame. 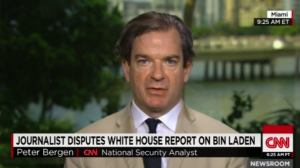 With the announcement Bin-Laden was dead, the birth certificate story petered out, and the media was taken by the Bin-Laden story as it unfolded in bite-size pieces. A daring nighttime raid by Seal Team 6, a quick execution, and then a burial at sea was all Obama needed to satisfy Americans. But now, a noted liberal journalist isn’t so sure Obama was being truthful about the ordeal. And CNN was one of the first to let the story air out just a few days ago. Apparently Seymour Hersh, the journalist who broke the prison abuse story at Abu-Graib along with reporting on the My Lai massacare in Vietnam, thinks Obama was up to no good during that time in 2011. He published his story in the London Review of Books where he’s been a regular contributor since 1993. CNN reported Hersh made the following accusations against Obama.